I might scour my vocabulary for hours and still never come up with a better single adjective to describe Godzilla Against Mechagodzilla than "frivolous". Which is on the one hand not a word that really suggests and kind of special sin or even a legitimate failing of any sort, but on the other is almost entirely devoid of any positive connotations in any context. At any rate, one would generally prefer not to have to resort to such judgments in connection with a movie that one had hoped to actively enjoy. Godzilla Against Mechagodzilla - the wordy, inarticulate official English title for a film that by all rights should be known as Godzilla X Mechagodzilla - finds Tezuka Masaaki returning to the director's chair two years and two films after he oversaw Godzilla vs. Megaguirus, a film which shares the most signal element of X Mechagodzilla's style: they both feel like big ol' dippy live-action cartoons, capturing the most nutty, breezy, "gee whiz!" elements of the 1970s Godzilla films in a film with considerably more budget and considerably less Fukuda Jun. Compared to Megaguirus, X Mechgodzilla vastly improves in one important respect: you can actually tell that it cost some money to make, and if the CGI effects aren't as across-the-board great as in the previous year's Giant Monsters All-Out Attack, they're still miles above any of the earlier films in the franchise, used only as necessary and executed with a fine level of weight and texture to seem like they actually belong in some physical reality. But I'm switched if I can come up with literally a single other thing to say in the movie's favor. The film opens in 1999, with a spectacularly explicit and specific background laying out exactly which movies in Toho's long history of daikaiju eiga "count" this time around: the original '54 Godzilla, 1961's Mothra, and 1966's War of the Gargantuas. Which is... weird, right? I'm not just being small-minded about it? It seems really specific and odd that those and only those are the films which make up this film's background. But I guess Tezuka and screenwriter Mimura Wataru knew what they were doing, even if I emphatically do not. Anyway, it happens that Japan has been fairly good at keeping its giant monsters in check all these decades, but the fear has always been, for 45 years, that whatever creature rampaged through Tokyo in '54 would have a cousin. And it finally happens that a second Godzilla arrives to wreak terror, and none of the weapons honed in the subsequent invasions by lesser foes are up for the task of stopping it. It's the fault of nobody other than whatever angry god allowed such an unstoppable beast to exist in the first place, but blame is placed squarely at the feet of Yashiro Akane (Shaku Yumiko), a gun technician and tank driver whose inability to keep control of her vehicle sent several soldiers careening into the path of Godzilla's giant feet. And she herself has been more than willing to own this guilt, spending the next several years belittling herself for the lives lost in that fight. 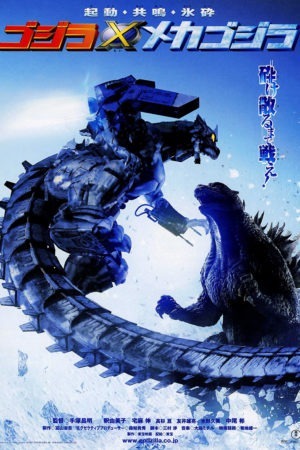 Fortunately for the movie, other people have had a more productive four years: scientists led by genetic robotics expert Yuhara Tokumitsu (Takuma Shin) have succeeded in using the bones from the 1954 Godzilla killed by the long-lost Oxygen Destroyer as the basis for a cyborg Godzilla-like creature they call Kiryu, "Machine Dragon". Why in all the living hells Kiryu needs to have actual Godzilla DNA in its matrix, other than to enable the second act sequence where it bows to its genetic destiny and goes on a city-destroying rampage, is something the film desperately attempts to explain, but it would take a more forgiving fan of giant monster movies than I to buy a single damn word of it. Also, metaphor for building bigger and nastier weapons and machines to take care of our problems for us. Akane is made crew head for the Kiryu team, with the support of one Lt. Togashi (Takasugi Ko), and the particular resistance of 2nd Lt. Hayama (Tomoi Yusuke), whose brother was lost in the exact same accident that Akane inadvertently caused. And this does not improve her mood at all; in fact, the only thing that seems to spark anything in her self-lacerating grieving process at at all is the preternatural moral advice given by Sara (Onodera Kana), Tokumitsu's motherless daughter. Which fits in well with Tokumitsu's apparently indefatigable desire to have Akane keep shooting him down every time he tries to ask her out. Somewhere in all of this, a giant lizard wanders around setting things on fire with its atomic breath, but one could easily be forgiven for losing track of Godzilla in this particular Godzilla film; it's more of a background threat than an active, constant terror. And this is certainly the element of X Mechagodzilla that leaves me the chilliest. It's always beyond admirable when a daikaiju eiga makes a concerted effort to bring some human drama to the table to shore up the scenes of monster action - it is, verily, why the 1954 Godzilla is a genre masterpiece, is it not? and why 1975's Terror of Mechagodzilla is so vastly rich and deep and grave compared to the zany nonsense that make up the rest of the '70s Godzilla films? - but the Millennium Series of films, at this point, had made the same mistake enough times that it starts to feel endemic: you can't just make a character sad and show them become less sad, and say "that's it, we've done our character building!" It takes nuanced writing and strong performances; X Mechagodzilla doesn't really have the former of these, preferring instead to traffic in foggy clichés (you noticed, I hope, the bit where a wide-eyed little sage of a child speaks Life Affirming Truths that make Akane's growth possible - there are undoubtedly narrative tropes that move me less than the "heart thawed by a wise child" bit, but I am not presently able to think of any of them) and lingering scenes of arbitrary military science. It absolutely and violently does not have the latter of these, strong performances, at least not in the case of Shaku, who was a fashion model at the time she was cast in this film, and does what all fashion model actresses in sci-fi action movies do, all over the world: look pretty and not emote. She is, after a fashion, a good fit for a movie that feels somewhat like Top Gun redone as a kaiju film: it is breathless impressed by military tech, which it depicts with loving and at times stultifying detail, as triumphant music (by Oshima Michiru, one of the film's secret weapons) lovingly gallumphs out of the speakers. The humans operating that tech it tolerates with kindly acceptance; the activities executed by that tech are of interest primarily in that it facilitates the movement of finely-shaped metal gliding around and flashing in the sun (not for nothing is the film's most elegant shot, by far, a silhouette of Kiryu in the midst of ruined buildings as the sun sets in the background, a glamour shot of the most profoundly unapologetic sort). The whole thing reminds me a bit of the sort of anime I don't watch, the kind where there are robots and technobabble and damn little else. It all goes by smoothly enough; Tezuka is a bright and bubbly director who keeps scenes light on their feet and doesn't encourage the actors to linger over moments they can dance through instead. And his frothy style is a good fit for the shiny sci-fi material. The movie plunges along like a comic book, trashy and fun and insubstantial, with just enough comedy (Takuma's blithely lovelorn scientist is the most likable and watchable of the humans, by far) that it feels like the whole thing is funny, even in its serious moments. There are places where it gets so light and airy that it just about floats away: an early evacuation sequence, with a long layover set during a kids' baseball game, falls on the wrong side of goofy. But it is pleasant enough. But it's so light on Godzilla! That's fine in a movie like the '54 Godzilla, where the constant awareness of the monster as a potential threat gave the whole movie a spine of tension and dread. Those two qualities are almost deliberately banished from X Mechagodzilla, which often seems to forget about Godzilla altogether in the lengthy stretches where it doesn't appear. When it does, the results are perfectly satisfactory, if not particularly distinguished: the suit is one of the most pointedly bland in the series, with a bit of a mean look coupled with a very expressive pair of eyes, jagged but not outlandish spines, thick but not chunky legs and trunk, active but not snakey tail. It's the perfectly average Godzilla design. And the fight choreography is clean and straightforward without taxing Kitagawa Tsutomu too much inside the suit, or giving him any real chance to show off personality. The new design of what is explicitly not called Mechagodzilla has an elegance and mechanical plausibility that trumps the 1993 model, while being less pulpy than the 1970s version (which remains, by leagues, my favorite); it is sleek and handsome and given many awe-inspired shots so that we can really get a look at it. Not so much so we can see it engaged in machine-on-monster action. It's a serviceable movie, but overall not a very fun one, and everything about its energy wants very much to be oodles of fun. It falls into a kind of valley, perhaps: not trashy enough to be idiotic genre entertainment, not serious enough to have resonance. Purely to scratch the kaiju itch, it gets the job done, but there's absolutely nothing of inspiration or energy to this one, just a kind of "good enough" quality that increasingly feels, as the movie goes through scene after scene without any trace of Godzilla, that it isn't good enough.